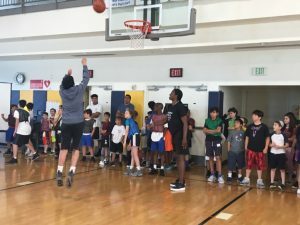 This week’s inaugural session of 2018 Sinai Temple Basketball Camp was an astounding success! 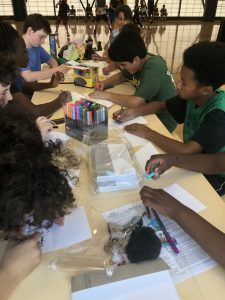 Sinai Temple had the privilege of hosting over 80 campers for five days of fun, drills, games, social action projects, friendship, learning, crafts and more. Some of our campers even joined STBC from Jewish Big Brothers Big Sisters. 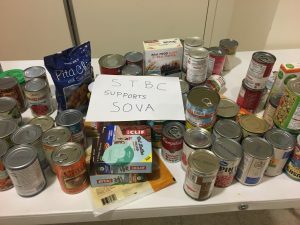 A new and exciting element of STBC this year was the social action component- Beyond Basketball. All week, campers collected canned goods for SOVA, along with books for children who may not have access to them. In addition, on Thursday, our older campers were trained on how to run a basketball clinic for athletes with special needs. Following the training, our campers put their skills to the test, as they coached children from KEEN (Kids Enjoy Exercise Now), including a wheelchair bound child, as well as a blind teenager. Our campers were compassionate, loving and had a great time, and so did the KEEN participants! STBC also featured several celebrity b-ball guests, including Terrence Roberts, David Blu, Daisy Feder and Talia Caldwell, who spoke about their time playing professionally and what it taught them both on the court and off. STBC is ideal for boys and girls entering 2nd-8th grade, of all skill levels. There are two more sessions of camp left, July 23-27 and August 6-10. To learn more and register, click HERE. Click HERE to view a full Facebook album of photos from the week. Click HERE to view a great compilation video from the week!